On April 23, #ProtestPP will conduct the first annual nationwide protest at Planned Parenthood facilities nationwide, to be held on the 4th Saturday of April every year until the abortion chain no longer preys upon our communities. We’ll call on Congress and the States to cut off all government funding to Planned Parenthood and bring charges against all those responsible for the horrific baby parts scandal. And we’ll demand that all charges against undercover journalist David Daleiden be dropped. 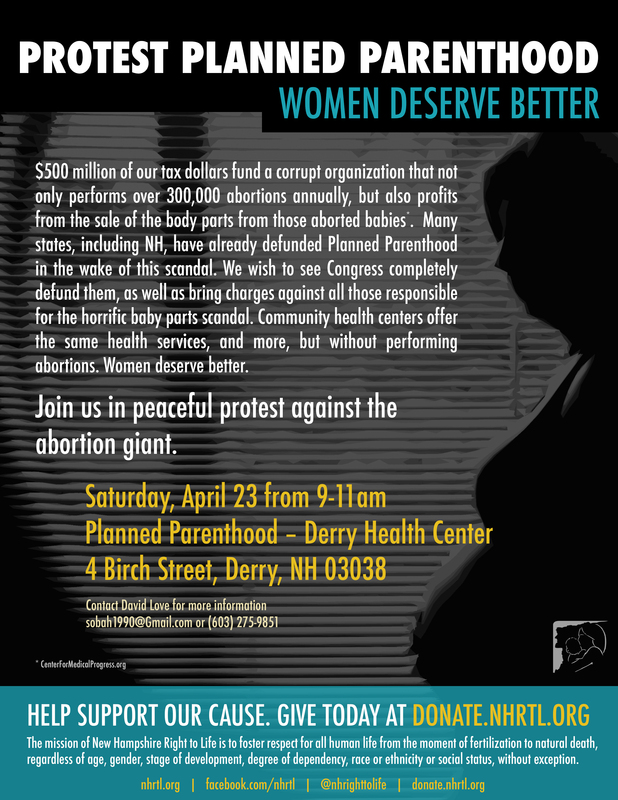 Join us April 23 as #ProtestPP marches forward! Come out April 23, and bring your friends — especially those who haven’t been out on the front lines at an event like this before. We may never have a better opportunity to strip Planned Parenthood of their massive $500 million taxpayer subsidy and expose the truth about this corrupt organization. So mark your calendar and plan to come out for the National Day of Protest against Planned Parenthood on April 23! Great.I was present last from the beginning-the dump, service, rally and procession,and the bio ethics session. A woman said there was going to be another protest this Sat at the State house–PP will be there. Is this still on? The woman’s name was Kathy.I didn’t see it on the NHRTL website.I live in Wilton,am a preacher ,and missionary to the Philippines. We must fight,and pray,and know that God is both sovereign and on our side(Ex 20:13). IT was edifying to assemble with other likeminded folks.